For the most part, these are properties where you can plant a home, keep some critters, and just enjoy your country life. If you want to grow some specialty crops, they can be accommodated here as well. #1139: Central Montgomery County - 14.7 acres, all open but with a few scattered young trees plus a small copse of woods, though more is brushy. It is in a good area with a few nicer homes here and there - no junky ones - and it has the Fonda schools. 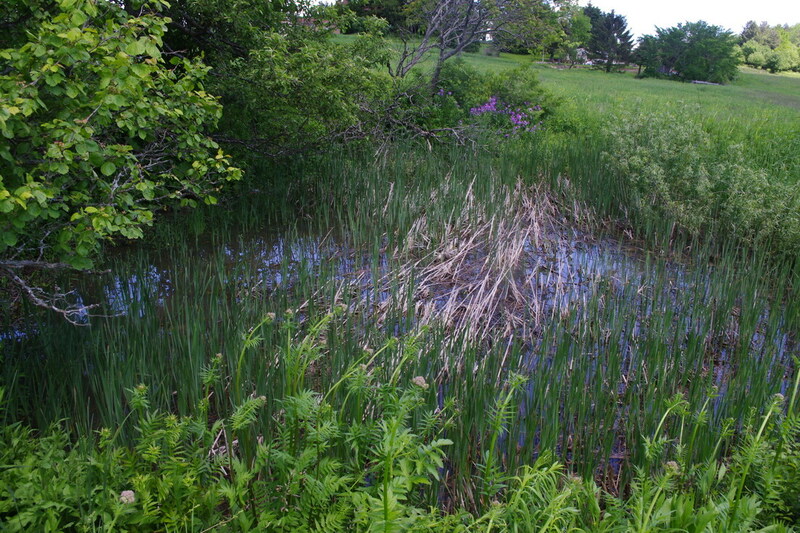 There are 341.8’ of road frontage on a quiet country road and also frontage on a tiny stream as well as a shallow pond. Good for a home site with land for critters or recreation and all the peace and quiet one could want. Or it could be subdivided. Taxes are around $800 and you can buy it for $27900. B - has 5.3 acres and is $24000. It is all unused pasture, mostly open but with young trees here and there. It has 920’ of frontage. C - is 12.5 acres and is $29000. About 5 are in hay meadows and the rest is a mixture of unused pasture and wooded. There are 655’ of frontage. D - has 7.2 acres and is $29000. It is rolling sidehill, a mixture of unused pasture and woods, with views. There are 875’ of frontage on two roads. 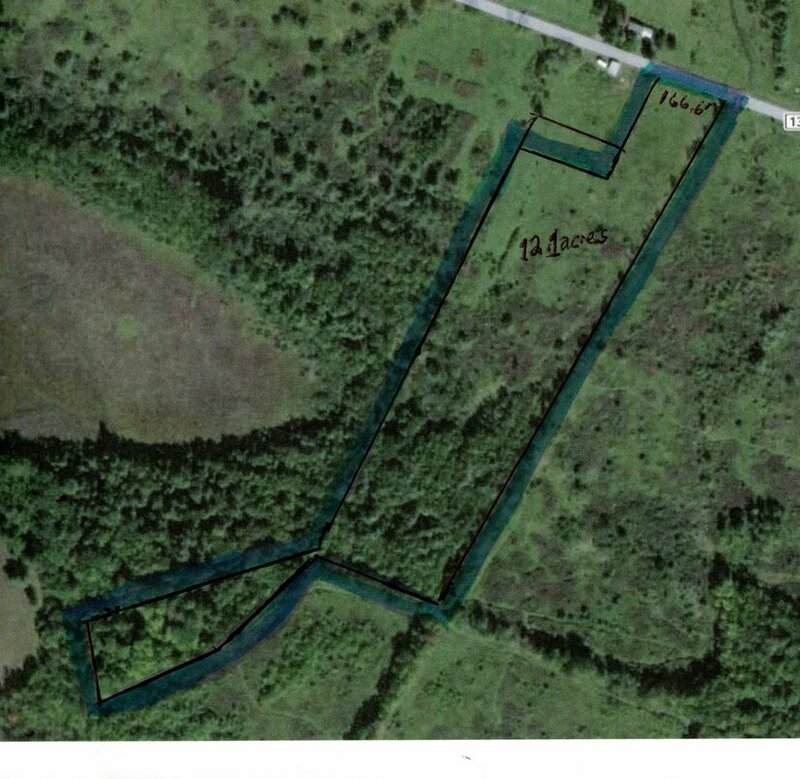 E - has 23 acres and is $59000. It enjoys fine views and 10 acres of this are in hay meadows, another 13 are abandoned pasture or wooded. It has 1171’ of frontage. F - has 5.2 acres, mostly fallow hay field with some unused pasture/woods for $27000, Some views and 645’ of frontage. The remains of an old school are here (look hard to find it! ), so there must also be a water supply as well. We can discount for the purchase of multiple parcels. Please note that the closing may be delayed a month while we finish subdivision and get the surveys made, so you will have ample time to done what you need to do as well. #1147 - SE Montgomery County. 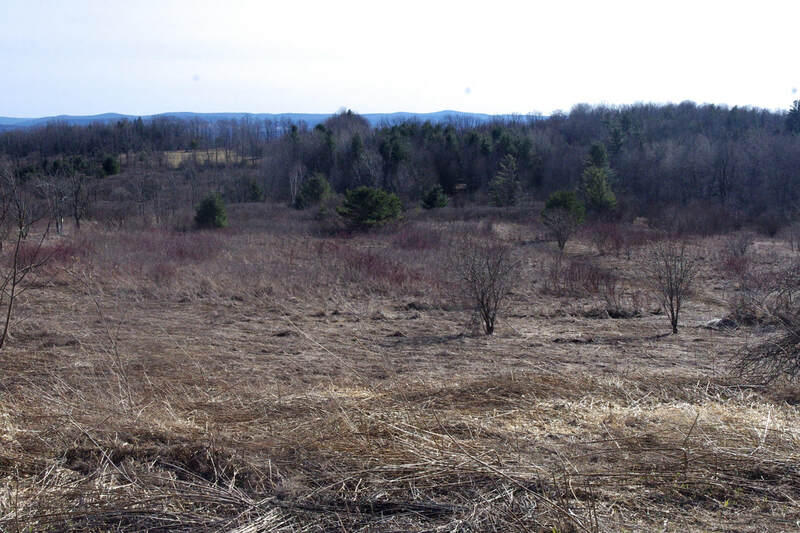 Almost in Schoharie County is a 12.1 acre tract with both southern exposure and views. 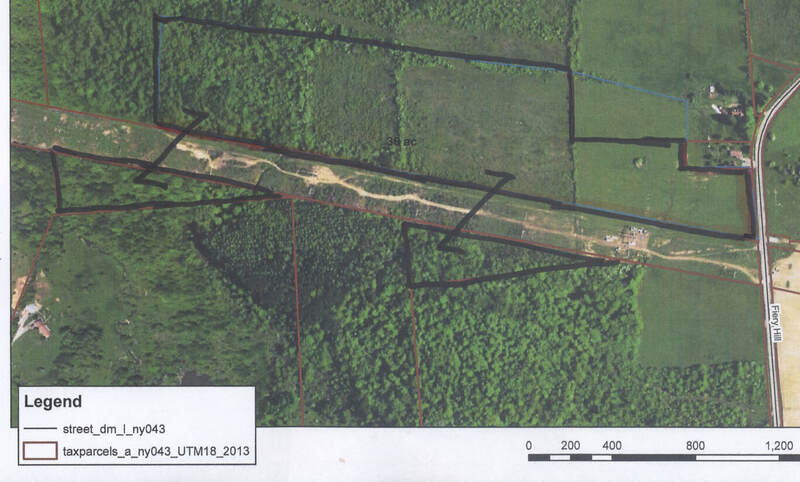 It has 166.6 feet of road frontage, a tiny stream, and consists of mostly wooded land with open land nearest the front. Power is right by the road. The area is up and coming, a mixture of older homes, some quite nice, and even nicer newer homes, all onj enough acres so they are not near each other. Less than 1/2 hr. here to downtown Albany, with only 1 traffic light and no tolls between you, so it’s a great spot for a commuter. The owner is ready to sell and has priced it at just under $2000/acre - $24000 total. 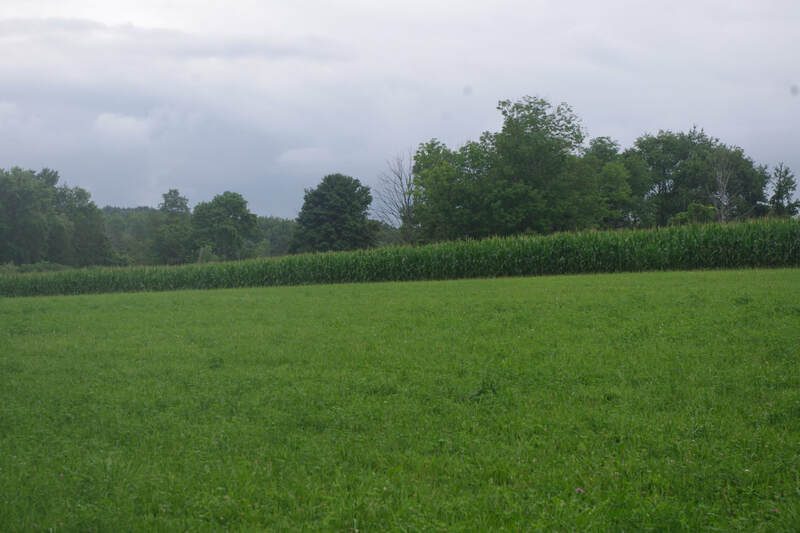 #1131 - Central Montgomery County - SOLD NEW LISTING This 4.9 acre field was in corn last year but was not rented this year as the owner thought she might be selling it and did not want to encumber it for a new owner. The land is flat, all open, and has 916’ and 994’ feet of frontage on each of 2 roads, one of which is dead end. Just a couple of miles to town too. Priced to sell at $18900. 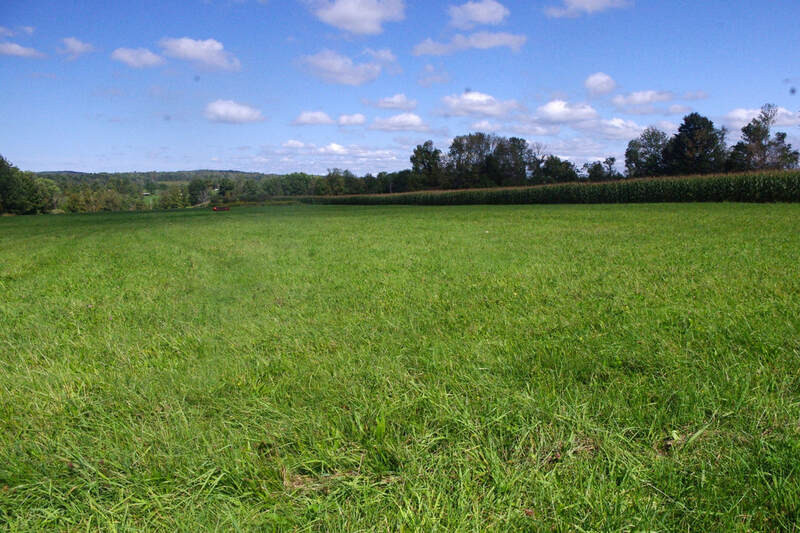 #1133 - Southwestern Fulton County - This is a beautiful piece of crop land, 42 acres, and it’s being surveyed now. It might prove a bit bigger when the survey is completed. It is nearly all open and in a very good state of cultivation, with corn, alfalfa, and clover/grass hay. Most of the land lies on a gently sloping crown and it’s most all well-drained and fertile. The owner takes the hay off and rents the rest of the ground to a neighbor for corn or soybeans. Nice views can be enjoyed from it and it has 310’ of road frontage on a quiet county road. I’d say there are 40-45 tillable here, with just a tiny amount that isn’t. How can it have more tillable acres than total land? A power line cuts through the back and the owner gets to use that land as if it were his own. You can also access the land through the power line driveway if you wish to come in that way. Taxes are only around $1000 and just $85000 will buy it. #1001 - Western Montgomery County - We have had this for sale for a long while and the owner has slowly dropped his price until recently, when he dropped it significantly and quickly - time to get serious. It is a great piece of land, spectacular views, protection from winter winds, several great home settings, a view of the Mohawk River. There is a 60x60' bank barn, which looks straight & square, but needs work. There is spring water and a tiny never-failing stream which grows watercress. 30+ surveyed acres , over half tillable and farmed organically. $75000 for a quick sale. 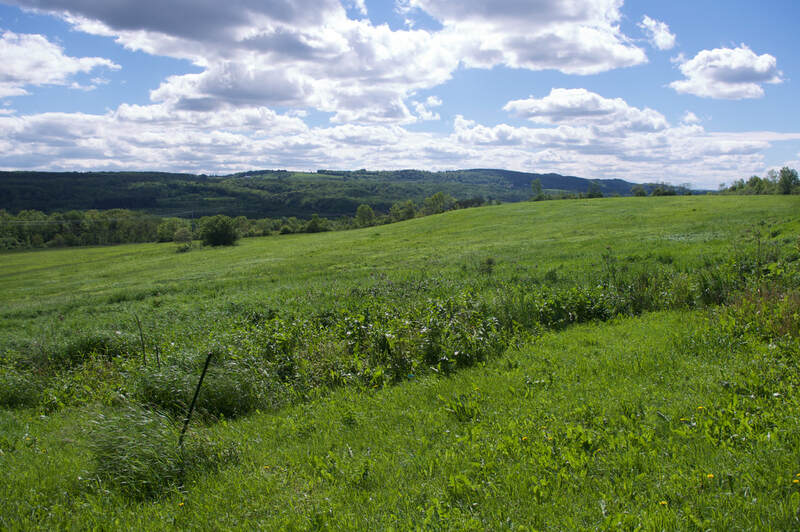 #1112 - South-Eastern Herkimer County - We have 45 acres with long views, 250' of frontage, a attractive mixture of hay meadows, an older pasture, and woods. And it is certified organic. $67500. More land available. Also on the horizon is an adjoining 2 acres with a trailer that we may be able to add later on. The two would make a great parcel. Didn't find exactly what you wanted? We maintain good relations with our competitors and, even though they do not specialize as we do, once in a while one of them will have a place. If you spy one, let us know, and we can work with it for you. We don't have to give up our good working relationship.